NORRISTOWN, Pennsylvania—This time Marguerite “Margo” Jackson got to testify. Last year, during the first criminal trial of Bill Cosby on three counts of aggravated indecent assault, the longtime Temple employee emerged during the proceedings saying that she had once roomed with Andrea Constand during a road trip for Temple women’s basketball and, during the road trip, Constand told her that she could set up a famous person for money with a fake sexual assault claim. Jackson was not allowed to testify by Judge Steven O’Neill that time because Constand said she didn’t recall knowing Jackson. After the defense presented several people who testified that Jackson and Constand had known each other while at Temple, Jackson was allowed to testify this time. Answering questions on Wednesday from defense lawyer Kathleen Bliss—whose tough, grilling demeanor transformed into soft, gentle, and patient for a key Cosby witness—Jackson said on the stand exactly what was expected: At the time, Jackson was an academic advisor for the women’s basketball team and sometimes she traveled with them. In February of 2004, during an away game in Rhode Island, Jackson and Constand were rooming together when a high-profile sexual assault case came on the TV. (In her statements, Jackson has never named who was the famous person in this case.) That started a conversation between the two women, and Constand said something similar had happened to her, but Constand didn’t report it because she couldn’t prove it. Jackson says she pushed Constand because “I would report it.” Then Constand asked Jackson what the case on TV was about, and Jackson recalled saying that it was a civil case, so it was about money. “Money is the best motivator,” Jackson recalled telling Constand. Finally, Jackson pushed Constand a third time and Constand, Jackson testified, admitted that her story was made up. Jackson said that she never thought about reaching out to the Cosby team with this story until she went on a cruise with her sister and a cousin in 2016. On the cruise, the trio went to see a comedian perform—Jackson didn’t name him in her testimony, but said “he was pretty funny”—and afterward the comedian offered to buy her a drink. That lead to Jackson talking to him. They got in a conversation about the Cosby case, and Jackson told him her Constand story. The unnamed comedian, Jackson said, told her, “I will put you in touch with the Cosby team.” She then heard from Brian McMonagle, the lawyer who, at the time, represented Cosby. Bliss lead Jackson though her questions. Jackson said she was not getting paid for her testimony, even throwing in a snicker as if the suggestion were ridiculous. Jackson said her life had changed since her name was first reported; Jackson testified that people had called Temple threatening to withdraw funding and saying she didn’t deserve a job. On cross examination, prosecutor Stewart Ryan asked Jackson who was it that first read Jackson’s statement on the courthouse steps for reporters last year, making it very public. It was Andrew Wyatt, Cosby’s PR person. (It did not come up in court, but I was at the trial last year when Wyatt did this. Not only did he read her statement on the steps, he and the PR team handed out photocopies of Jackson’s statement, with her name on it, to any reporter who asked for it.) Ryan also had Jackson point out that she had a launch party for her entertainment company a little more than a month after Wyatt publicly read her statement. Ryan continued. The first statement didn’t mention the comedian or the cruise, and the second one did. The first statement also doesn’t have the phrase “money is a great motivator” during the back and forth with Constand. 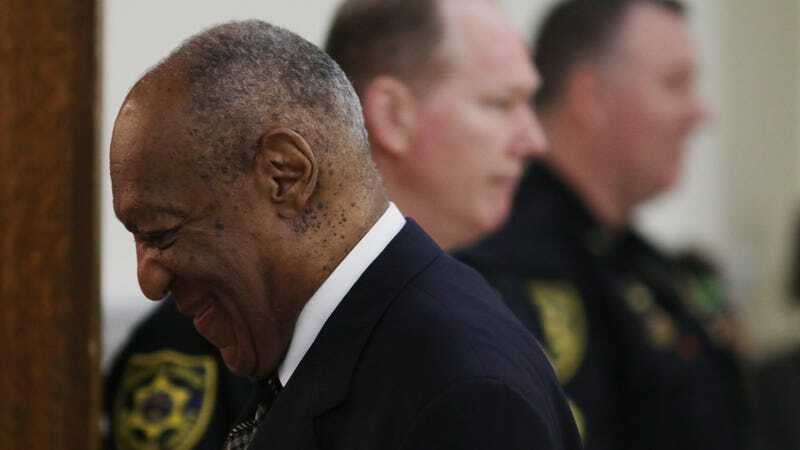 For each difference, Jackson said that it was she and Bliss who decided to put those in the second statement because “that is exactly what [Constand] said.” Jackson insisted that nobody on the Cosby defense team asked her to add those new details because it fit with their new defense strategy for the retrial—portraying Constand as a gold digger who was lying for a big pay day. Ryan also went over Temple expense reports with Jackson. The reports showed that Jackson, who insists she traveled with the team in 2004, did not submit any expense reports coded for women’s basketball that year. Constand testified last week that she never shared a room while traveling with Jackson. Tomorrow is being dubbed “experts day” as experts for the prosecution and the defense are expected to be called.